The ADS1605 and ADS1606 are high-speed, high-precision, delta-sigma analog-to-digital converter (ADCs) with 16-bit resolution. The data rate is 5 mega-samples per second (MSPS), the bandwidth (3dB) is 2.45MHz, and passband ripple is less than ±0.0025dB (to 2.2MHz). Both devices offer outstanding performance at these speeds with a signal-to-noise ratio up to 88dB, total harmonic distortion down to 99dB, and a spurious-free dynamic range up to 101dB. For even higher-speed operation, the data rate an be doubled to 10MSPS in 2X mode. The ADS1606 includes an adjustable first-in first-out buffer (FIFO) for the output data. 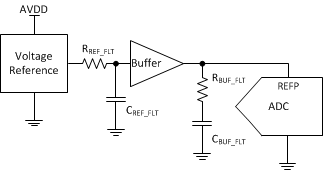 The input signal is measured against a voltage reference that can be generated on-chip or supplied externally. The digital output data is provided over a simple parallel interface that easily connects to digital signal processors (DSPs). An out-of-range monitor reports when the input range has been exceeded. The ADS1605/6 operate from a +5V analog supply (AVDD) and +3V digital supply (DVDD). The digital I/O supply (IOVDD) operates from +2.7 to +5.25V, enabling the digital interface to support a range of logic families. The analog power dissipation is set by an external resistor and can be reduced when operating at slower speeds. A power down mode, activated by a digital I/O pin, shuts down all circuitry. The ADS1605/6 are offered in a TQFP-64 package using TI PowerPAD technology. The ADS1605 and ADS1606, along with their 18-bit counterparts, the ADS1625 and ADS1626, are well suited for the demanding measurement requirements of scientific instrumentation, automated test equipment, data acquisition, and medical imaging.